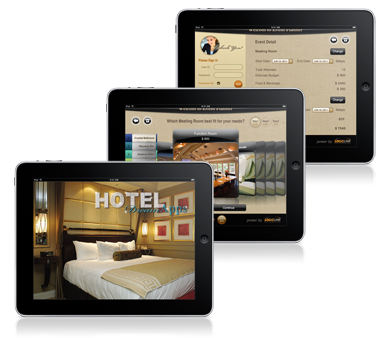 iPad Apps Include Hotel Concierge, Lobby Ambassador, Event Planner, and Dining Touch N Serve FOR IMMEDIATE RELEASE—July, 11 2011—Ann Arbor, MI—Logic Solutions, Inc. announces the release of Logiclink’s Hotel Dream Apps, a suite of four iPad applications for hotel guests and staff. Hotel Dream Apps include Hotel Concierge, Lobby Ambassador, Event Planner, and Dining Touch N Serve. The applications are customized for each hotel property though a pioneering mobile content management system. Logic Solutions designed and developed all four applications. Hotel Concierge provides guests with information and access to: hotel dining options, local attractions, guest services, virtual room tours for upgrades, maps and directions, airline boarding pass access and mobile printing, flight information, and a multilingual virtual concierge that works by in-app VOIP. Lobby Ambassador is used by hotel staff to manage guests’ lobby needs such as check in/out, housekeeping requests, bell desk, room upgrades, VIP butler service. This line buster app communicates via instant text messages and email integration with point of sales and property management systems. Event Planner allows hotel staff to create, book, and confirm events and event details, without having to leave the client’s side. The app can manage group events, weddings, and meetings; schedule rooms; display room layouts and virtual tours; create agendas for guests and status reports for management; order audio visual equipment and catering needs. Dining Touch N Serve provides on-property restaurants the ability to continuously manage menus (including graphics, descriptions, and prices) with integration to their point of sales system. Customers use the app to browse menu options, order and pay in-room and poolside, and order from their mini bar. Staff can also use the app to manage mini-bar inventory. All four apps can be modified through a proprietary content management system, allowing the facilities to save multiple versions of information (seasonal or daily menus, for example) to a backend database or locally on the device. This allows staff to instantly change skins and information on any device. In addition, there is an automatic synchronization mechanism that saves all work created on the iPad to the remote database. Logiclink partnered with Logic Solutions to design and architect the mobile apps because of the companies’ long and successful relationship that began in the early 1990s, with the launch of Business Automation Center @Hotel. In 2010, Logic Solutions built the technology to allow mobile device rental at BACs around the world. Later that year, Logiclink launched iRemote Print, providing hotels the technological means to sell remote printing services to their customer—technology that was also developed by Logic Solutions. The tremendous response to these initial mobile technologies prompted a fervent demand from Logiclink’s customers for highly functional mobile apps to give hotels the means to serve their clientele with greater efficiency and high impact. Logic Solutions’ CEO, Jimmy Hsiao, states, “We have been developing and delivering innovative mobile apps on all platforms for years, and because of our heavy research and development in mobile content management systems, we knew we could successfully create highly sophisticated and integrated applications required by luxury hotels and their guests.” About Logiclink, Inc. Logiclink Inc. was established in 1990 with the mission to bring value and efficiency via automated transaction processing to the hospitality industry. We accomplish this by combining high-tech products with the high level of services mandated by our hotel clientele. We strive to continuously expand our product features, which currently include an integrated content management kiosk product in public and lobby areas, an iPad Concierge Service Rental Program, and iRemotePrint for hotel guests. For more information please visit http://www.logiclink.com.